NEW REMODEL 2018 - Oceanfront Nonsmoking Studio St Thomas - Walk-out to Pool!!! NO IrMaria Condo Damage!!! This is one of the very few OCEANFRONT STUDIO condos for vacation rental at Bolongo Beach, St. Thomas USVI. This NEWLY REMODELED SPACIOUS Studio condo with KING bed, Living/Dining furnishings, full Kitchen, A/C, 3 ceiling fans, TV with DVD player and HDMI, Wi-fi, full Bathroom with newly tiled shower and OCEANFRONT patio is located in prime Watergate Villa 16, which has 1st floor walk-out access to the BEACHSIDE POOL. Just freshly painted and remodeled for all new furniture, linens and other personalized amenities in winter 2018. LOCATION, LOCATION, LOCATION!!! No US Passport Required to USVI. Our condos are located where you want to be! Centrally located on the south sunny shore of St Thomas, close to everything! Charlotte Amalie, Red Hook and other Beaches within a short 10-15 minutes. Arrange a taxi or rental car to get around. EXQUISITE onsite oceanfront amenities, 2 restaurants, 2 pools, free parking, snorkeling or sunset catamaran sailing (Heavenly Days), Wi-Fi, personalized amenities of home + for guests who reserve with us, we provide detailed island activity & dining information in email and in condo to help you plan your worry-free vacation in the US Virgin Islands. Our oceanfront location at Watergate Villas, Bolongo beach in St. Thomas is the ultimate vacation destination, with year-round 75+ degree temperatures, delightful island breezes, & excellent oceanfront views of Bolongo Bay and it's beautiful clear-blue water, coconut palm trees, tropical landscape and morning sunrises over the Caribbean sea. This specific unit is PRIME OCEANFRONT!!!! Perfect for a couple or small family (1-4 persons). Walks out to pool and beach access! For those of you who may want to dine-in and enjoy the spectacular views and privacy of your condo, there is a fully equipped kitchen with the appliances and cookware that you have at home, plus a furnished patio right off the kitchen and LR. The close proximity of the condo to the pool and beach will appeal to guests. No need to pack and carry a cooler for the day. From the pool, you are close to your condo for cool refreshments; and at the pool is direct access to the beach and ocean. Location is everything when you are on your dream vacation, and villa 16 is best in the complex - NO trekking down a steep hill or sweating through a hot parking lot to get to the pool or beach access !!!! You are within only a few feet of the refreshing pool from this prime unit. We reside on island and offer the best vacation rentals and real estate services through Island Time Properties/Real Estate, as well as personalized snorkeling and island-hop excursions in the US and British Virgin Islands aboard VI 'Rock On' Charters with Capt Scott (turtles and VI beach bars are our specialty - same contact info as condo). ACTIVITIES: St. Thomas offers a myriad of activities for all to enjoy. EVERYTHING FOR EVERYONE! For guests who reserve with us, we provide amenities such as cooler, portable chairs, beach towels so that you can be mobile to all the beaches, as well as detailed island activity & dining information/suggestions in email to help plan your vacation in the US Virgin Islands. Snorkel the close to shore reef. Schedule a snorkeling boat charter or book onsite to go out on Heavenly Days catamaran at Bolongo. ONSITE DINING: Not only can you cook your own meals, but there are 2 oceanfront restaurants are right on-property: Mims Seaside Bistro, and Iggies Oasis. Mim's Seaside Bistro, where you can enjoy all-you-can-eat shrimp (Thurs nights), Caribbean lobster surf and turf, right at the ocean's edge, as well as Iggie's Oasis at Bolongo hotel's swim-up pool bar (sip, dine, swim, sip, repeat - you do need to be dining or sipping to use this pool) - lots of theme nights at Iggies Oasis - the temporary location until Iggies on the beach is rebuilt. BEST LOCATION: Condominium is located centrally between Charlotte Amalie and Red Hook on the south sunny shore of St. Thomas. Charlotte Amalie, known as the Duty-Free shopping capitol of the Caribbean, is a short 10 minutes drive west, and Red Hook is only 8 minutes drive east, where guests can take a person or car ferry to enjoy beautiful St. John within short 20 minutes. GETTING AROUND: A Rental car is recommended to experience the islands of St. Thomas and St. John most conveniently and economically. Taxis are also an option for getting around. CLOSEBY U.S. & BRITISH VIRGIN ISLANDS: St. John , USVI is a must see & is just a short ferry ride via person or car ferry from Red Hook, St. Thomas (No US Passport needed). The British Virgin Islands (BVI's) are also within ferry distance or sailing/snorkeling excursion. We now personally offer a boat charter for island hopping within the US Virgin Islands (turtle cove, Christmas cove/Pizza Pi boat, Water Island/Honeymoon beach, St. John/Waterlemon Cay etc - no US passport needed) and the British Virgin Islands (Jost Van Dyke/Foxys/Soggy Dollar, Tortola, Sandy Spit, etc, passport needed for BVIs). This could be your BEST vacation yet to support our island after the 2017 storms. We do have basic internet in the unit and a DVD player and HDMI for connecting your personal pre-loaded devices to the TV; noting that it's possible that cable TV, phone and high speed unlimited may not be restored by the time of your visit this Spring, but there are hot spots around and AT&T phones work well in St. Thomas for you to tether and mobile hotspot. We have basic Internet for email and some steaming of your subscriptions such as Netflix, Amazon prime, CBS, NBC, etc. We hope for cable and phone restoration by early summer but have already adjusted our rates based on this missing amenity. COME STAY WITH US! : Let us help you make your dream vacation a reality! St. Thomas is the ultimate vacation destination. For guests who reserve with us, we've done all the research and provide loads of concierge island activity and dining information in email and in the condo to assist with your vacation planning. As some reservations book a year in advance, you will not want to delay planning that special 'no worries' vacation to St. Thomas. MORE THAN 2 PERSONS??? 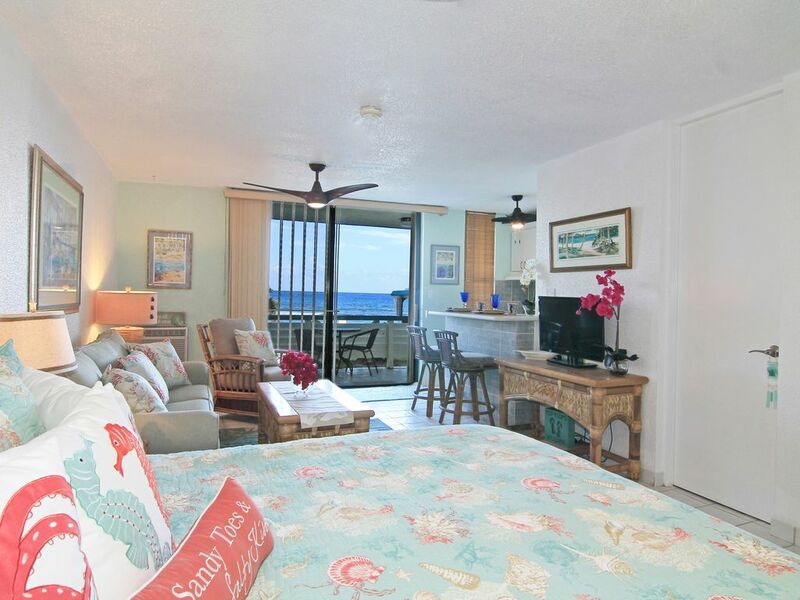 We also manage several additional oceanfront condos at this same property published at VRBO/Homeaway, including an adjacent 2BR in villa 16 ( vrbo 35690); as well as the only 3BR condo (homeaway 298319) and several other 2BR condos (vrbo 622508, etc). We truly have the BEST selection and personal amenities at Bolongo beach and longest vacation condo rental track record at Watergate Villas, Bolongo, since 2003!!! We set the bar! We sincerely invite you to make one of our oceanfront condos your Caribbean home away from home, and welcome you to contact us to learn more about planning a special vacation in tropical American paradise. Island Time Properties offers only the best personalized vacation rentals and boating charters. Here on island year-round to make sure all experiences are the best and many happy returns. Professionalism and southern hospitality Always! Manager, Capt Scott resides at and makes St. Thomas his year-round home. As the owner/broker/operator of Island Time Properties (real estate/property mgmt.) and VI 'Rock On' Charters (boating), he knows everything about the island and what to see and do. He is also the ONLY owner/manager to reside here and to have Studio, 2BR and 3BR condos close to each other at exquisite Bolongo beach to be able to accommodate a couple taking a retreat together or family vacations, as well as wedding parties or large family groups, with like-for-like amenities in the condos he manages on behalf of the owners as well as a couple of properties he personally owns. This location at Watergate Villas, Bolongo beach, St. Thomas, USVI is Prime oceanfront with pools, onsite beach that is popular for weddings, resort amenities available for rent on the beach, dive shop/boat, restaurants, but still quiet and quaint. This is a gem in the Caribbean, and a very difficult find for any island (and we've been to many islands)!!! It has EVERYTHING for EVERYONE - pools, beach, dining, parking, watersports/recreation or just a lounge chair and a beach towel and a book for a relaxing vacation! NO US PASSPORT REQUIRED TO USVI's. St. Thomas is America's tropical paradise. We manage and rent multiple condos close together at this same Bolongo beach location (2 Studio condos, 1 3BR condo (the only 3BR), and 5 2BR condos) in St. Thomas. Doing this for 15+ years, we've done all the research for you and provide detailed island planning information/suggestions to our reserved guests so you can plan a worry-free vacation in advance. We are on island to attend to guests, refresh the condos continuously, and also offer boating trips to snorkel or island hop. Perfect for couples, family vacations, wedding groups, etc. Easy direct access to Bolongo beach, just in front of the pool. Beach is very popular for quaint weddings. Local St. Thomas/St. John calling (340 area code) or US toll free numbers only. No collect or outbound long distance. Nice furnishings for comfortable seating, Ocean views and TV. ALL NEW FURNISHINGS in 2018!!! Small Mr. Coffee maker; takes normal coffee filters. This is a self catering rental. ITP provides a starter set of paper towels, trash bags, dish soap, hand soap and toilet paper. Full kitchen, including refrigerator, stove/oven, microwave, coffee maker, toaster, blender, cookware, dinnerware. . .
Digital cable TV (pending island restoration from the storms). TV has HDMI for connecting your devices for your online media subscriptions. Some paperback books and guest books. We personally operate VI Charters for the best personalized powerboating/snorkeling experience in the VIs (USVI and BVIs). Special pricing for all direct bookings, especially our personal guests. Freshly painted and remodeled 2018! Prime Oceanfront; Oceanfront Pool; Beautiful On-site Beach; Non-smokers; All new furniture; Air-conditioning A/C; free dedicated Wi-Fi insidel; TV with HDMI and DVD Player; Selection of paperback books; Fully equipped kitchen- microwave, refrigerator, stove/oven, coffeemaker, toaster, cooking utensils and dinnerware; Furnished patio; Nonsmoking interior; Iron with Ironing Board; Hairdryer; Ceiling fan; Washer/Dryer facility (convenient, same floor); King bed; Sofa Pullout option; Convenient free parking at condo (1 parking pass per condo). All Linens provided, including Bath/Beach Towels; and Starter supply of paper towels, trash bags, liquid and hand soap, shampoo, and toilet paper for each arriving guest. Special lockable Security-bar slider doors to enjoy the breezes at night & to walk out beach side. Vacation planning info in email before trip. Boat charters available! I have been going to St Thomas since the 1990's. I enjoyed this property and all it includes. Two walking restaurants, music and fun folks around. The unit was clean and ready to move into to enjoy my time on island. Close to many other places you will want to see while visiting. It was exactly what I expected and I truly enjoyed relaxing on and off the property. I highly recommend any of Mr and & Mrs's Browning's units. This property was clean & fresh everywhere! I'm talking the shelves inside kitchen cabinets, inside the kitchen drawers, even under the furniture!! Well stocked kitchen. Very thoughtful to include snorkeling equipment, beach chairs, and cooler. Super location for access to the pool and Mim's. The restaurant was never too loud, too late. My family and I rented both the two and three bedroom condos from Scott and Leah Browning. The condos were as advertised and more. The condos have modern amenities such as flat screen televisions and wi-fi. Both necessities when entertaining a 7 year old. The Brownings provided leisure items like floats, snorkeling gear and pool toys. We have had to rent these items at other locations we have stayed. From the initial contact through the end of our stay, Scott and Leah could not have been more helpful. They guided us throughout the process of booking and made everything so simple. We even booked Captain Scott's boat, Rock On, for a charter. My family and I enjoyed every minute of our vacation thanks to Scott and Leah. We will be returning to the St. Thomas and staying with them again! Thanks for helping us make great memories! Jesse, Tara and Temperance. The condo location is great (if you have a rental car, which we did). Nice being able to relax on the patio, have great access to near by beach, restaurants, water activities (340 Water Sports) and felt it was safe/private area. Like the other reviews the condo was set up nicely and the kitchen had the basics and a plus was the dish washer that worked and they had dish soap. Was also nice that the AC units worked well! Big bonus that you can walk to the beach bar and Mim's! Didn't have any problems with Mim's being to loud as they close at 10 pm. You need to eat at Mim's at least once while you are there....mighty good. We did rent jet skies from 340 Sports and for 30 minutes for each jet it was $75....worth it! Scott was great to work with an everything we need was in the unit when we got there. The only complaint our group had while there the week was the internet only works on the patio. We did spend most of our time on the patio as its so beautiful out, but it would have been nice to have it within the unit. With having the poor wifi is why I gave them 4 stars. Other than that if we are to go back we would most likely come to one of Scott's units. The condo location and position is wonderful. - the perfect combination of relaxing privacy and accessibility to beach activities, necessities, and restaurants. Condo is fully equipped with many amenities. We snorkeled with sea turtles and rays right off the condo beach! The pool was a bonus and large enough to swim laps. The restaurant food was very good and reasonably priced and next time we would pack a suitcase with nonperishable food items to cut on grocery store costs. Scott and Leah are very professional and provide intensive pre-trip advice with more info binders in the unit. We traveled with a 17 and 20 year old and they loved it too! Easy access to and from the airport. Many places to sight see, shop and snorkel on St. Thomas and the Ferry ride to St. John is a must with breathtaking sights and beaches, shopping, restaurants and activities as well - really a fantastic 2 for 1 vacation! We have stayed in 3 of Leah and Scott's units now, and they are clean, lovely, and priced to make them excellent value. Well maintained, air conditioners that WORK, and well stocked kitchens. Bolongo Bay is quiet, has 2 restaurants within easy walking distance (Iggie's, Mim's), stunning views of the ocean, great snorkeling, and walking distance to the St. Thomas Diving Club and the dock their boats leave from. For those not familiar with St. Thomas, Bolongo Bay is southern coastline, in between Charlotte Amalie and Red Hook. The entire island is a short drive away. We were also there a few weeks earlier when Isaac hit, and Scott stopped by just to make sure we were ok, had everything we needed in case the power went out, and were not nervous (which we weren't). The Brownings are very nice people, and we had a great time. Would I recommend this property? I already have...to both friends and family. At prime oceanfront Watergate Villas East, Bolongo beach! Our condos at Watergate Villas enjoy a Beautiful and Convenient central location on St. Thomas, with exquisite amenities, activities and restaurants on-site at Bolongo Beach. Escape the crowds here! Quiet and Quaint, our location is within short 10-15 minutes drive of all St. Thomas attractions. Nearby are Grocery Stores, K-Mart, Duty-Free Shopping, Red Hook Car and Person Ferries to St. John, Magen's Bay and STT Airport. Taxi Service and Rental Cars are available on island. We recommend advance reservations with Avis or Budget for renting a car. You’ll notice that each condo at Watergate Villas is individually owned, and all units are decorated, configured, maintained differently. Interior layout, inside amenities, and closeness to pool & beach will also differ. Selecting one of our condos will provide a smooth and easy rental experience and so many extra amenities missing from other condos. We reside here year-round to maintain fresh amenities and oversee the rental process vs so many owners that are off island. Rates are one of the many benefits of renting directly from an owner. Rates depend on # persons, # nights and season. Published rates for this Studio are up to 2 person occupancy (1 couple). Add setup fee per person for more than 2p in Studio. 3 adults maximum or total of 4 persons (small family) maximum - subject to owner's approval. OPTIONAL Add-ons: -If a housekeeping service is desired 'during' your stay, this can be priced based on availability (must be requested/paid before final confirmation) at $75 cost per cleaning. Please request at reservation if possible or before final confirmation. -Setup of the pullout is not standard; this must be requested at reservation. Cancellation policy: -No refund within 60 days of arrival; No refund for late arrivals, no show or early departures (exception: hurricane warning/evacuation for St. Thomas during your stay). Not responsible for trip incidents such as missed or cancelled flights or stateside weather. -25% of total amount cancellation fee (depending on unit) applies to all cancelled reservations greater than 60 days arrival. Inaccurate # of occupants, Smoking, Missing or Damaged items, as well as unreturned keys or parking pass, are subject to assessment.